Even at this early stage in her career, Hauff shows that she’s more than capable of shaping dance out of destruction, as well as leading the listener to moments of beauty, says Daniel Jones. Lately, techno’s cutting-edge movers have been rather closely linked with words one might not normally associate with a genre tied to dance clubs—names like noise, industrial, and punk. It’s a darker twist that has opened techno up to those who might not immediately find themselves attracted to the word—people such as myself—and it has expanded outward to infect listeners and producers alike. Those three aforementioned audio stalwarts don’t necessarily pop out immediately upon first listening to Helena Hauff’s debut EP Actio Reactio, mind you—though the connections are certainly there, given Hauff’s previous association with Blackest Ever Black cassette label Krokodilo Tapes. Rather, my immediate impression was of the stripped-down, vaguely nostalgic instrumentals of the so-called hypnagogics; specifically James Ferraro’s work under his Lamborghini Crystal moniker. There’s that same gasping, harrowing sense of space being compressed, particularly on the title track opener. The tribal beats stumble over each other in a frenzy, desperate to knock each other over, yet there’s still a sense of panicked order underneath it all. After tattooing the ears bloody with needle-like synth stabs, it slips into black leather with a darkened, Sandwellian beat undercut with sinister dub. The snarling, acid-tinged “Break Force” could initially be mistaken for an Adult. B-side, but while it swaggers in on the same shades-and-neon narcissynthim bass as electro—another strong influence for Hauff, as evidenced by the aforementioned Krokodilo Tapes release Obscure Object—there’s also a hollow feel beneath, a sense of emptiness that makes “Break Force” less a stomping anthem to the night and more like the beautiful memory of a cosmically bad trip. It’s “Micro Manifesto”, however, that engaged me the most—a bit strange, considering how minimal the track is. Perhaps it’s the space Hauff puts into the song; the denseness of the previous tracks made it feel like I was holding my breath. Here, Hauff finally allows the listener—and the music—to breathe. The beats are left behind as vacillating, birdlike sine waves wash across celestial ambience. The tenseness is still lurking underneath the opiated air, however; this is not a fun journey, but it is a transcendent one. It’s not audio perfection by any means; by the 4-minute mark “Actio Reactio” was giving me a bit less of both. I would have liked more of the explosive cymbalic touches scattered throughout. But as both an EP and a debut, Actio Reactio is structurally perfect: an immediate thrust into Hauff’s diversely hectic rhythms and influences, whipping you deliciously before the soothing ice is applied. It’s direct, and given the saturation of esoteric and ofttimes oblique artists working in the field of electronic music, that also makes it refreshing. Hauff’s newest release is in collaboration with F#X, a fellow resident DJ at Hamburg’s Golden Pudel club. Rather appropriately dubbed Black Sites, their combined expertise at manipulating audiences with dancefloor expectations means that even at its most foreboding, the Prototype EP has one prime directive: making feet move, and it aims to do this job well. That means that while Hauff’s more chaotic tendencies might still peek through, this is a more structured area. In fact, it feels almost like a primer for the club itself, incorporating touches beloved by both DJs in their own live sets. While the comparable differences are obvious between the two, it makes for a surprisingly good combination. The intensity is there from the get-go as “Prototype” enters on trance-primed thuds before rising into a more upscale plane with fun-kay house stabs. It’s a bit like watching two genres make love… or, as the track fades with hyper-crushed 8-bit noise, perhaps war (though who hasn’t wanted to hear harsh noise dropped in the middle of a typical house set? Nobody? Just me? Okay…). “N313P” starts out just as raw, birthed like a squiggly mess of sine waves before F#X’s smooth house vibes once more emerge, Hauff’s concrete bass snapping at its heels. By the time the wall of chaos returns, you’re left with the feeling of having been dropped in the middle of a hellish Ibiza (which is probably just the regular Ibiza) during an electrocalyptic speaker meltdown—and you still want more. Now that is a hell of a thing. 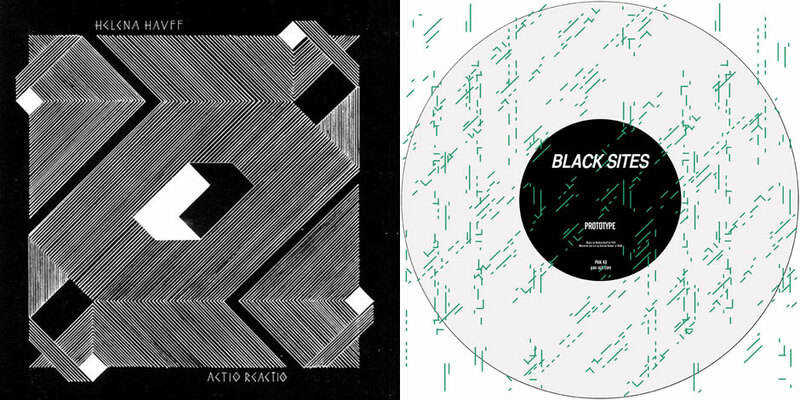 The Actio Reactio EP is out now on Werkdiscs/Ninja Tune. The Prototype EP is out August 23rd on PAN.